This bowl is of particularly high quality, well potted, very finely glazed and with a very attractive colour effect. It copies a rare type of ‘Ding’ ware from Quyang county in Hebei province, which is similarly shaped and glazed but has a cream-white body; see the exhibition catalogue Hare's Fur, Tortoiseshell and Partridge Feathers, Cambridge, Harvard University Art Museums, Cambridge, Mass., 1996, cat.no.16. The conical bowl rests on a straight, nearly solid foot with a broad, shallow footring. 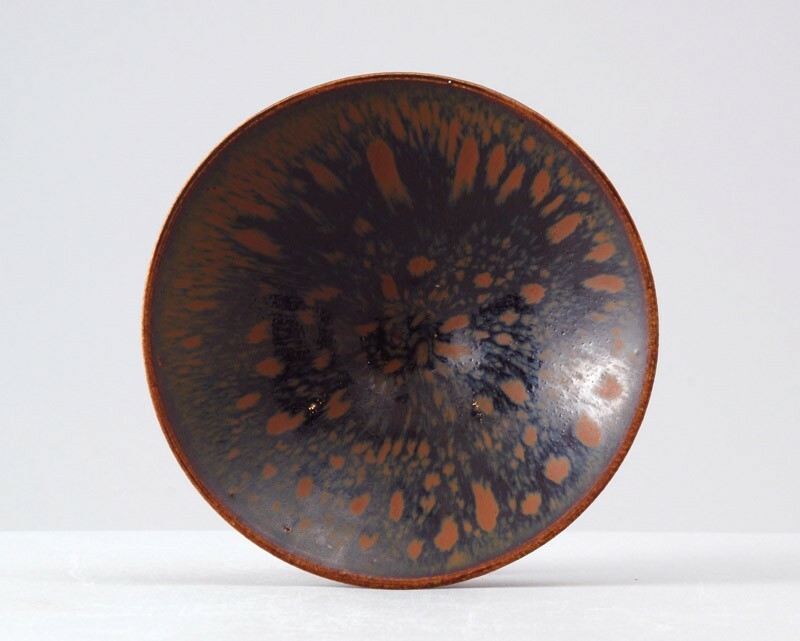 The even black glaze shows dense radiating rust-brown splashes, forming a mottled fur pattern. The glaze fades to a transparent brown at the rim and the outside is largely covered with a matt persimmon-coloured glaze with glossy black splashes running down from the rim. The foot and base are unglazed, showing a coarse body of a light buff colour.